Walt Whitman took great joy in walking the banks of Laurel Lake in Laurel Springs, New Jersey. The influences of the world he encountered there resonate in his most legendary works. Poets, educators, artists, naturalists and activists have come together to help save this enchanting woodland from development and steward its 3+ acres in perpetuity. It’s a familiar story for many of us. Due to ever-expanding development, we have witnessed the woods and streams we played in as kids consumed by sprawling neighborhoods and shopping centers. “Whitman Woods” is the only remaining undeveloped open space in Laurel Springs, and it is the only natural area remotely resembling the woods Whitman cherished. 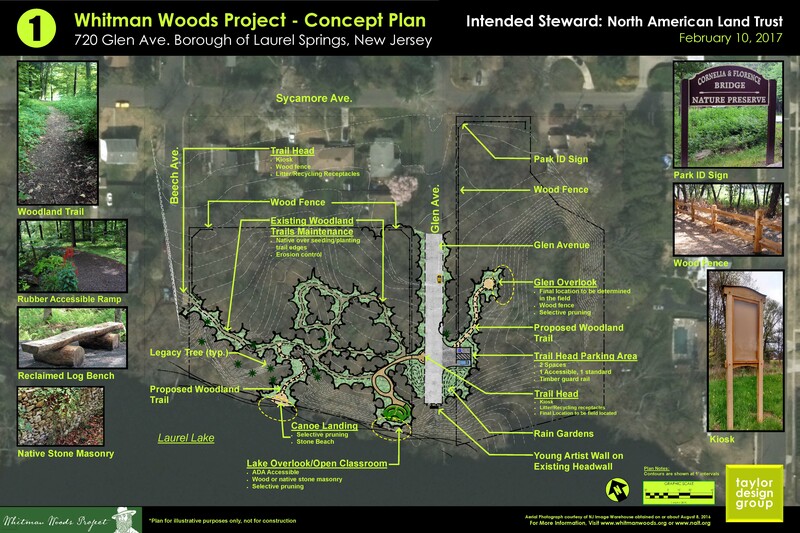 “Whitman Woods” is a profoundly organic conservation solution to conserve the last remnant of undeveloped old growth woods along a lakeshore that Whitman cherished and where bald eagles now forage. You can help now by donating here. Thank you so much for your generous contribution to support our efforts in protecting land essential to Laurel Springs’ natural, scenic, and historic character. NALT has an impressive record of success, and this is possible because of support from donors like you. We accomplish a great deal of our work by leveraging your dollars with funds from public and private partners. If Whitman Woods is unable to meet its goals and the mission can’t be completed, North American Land Trust promises to devote every contribution only toward the overall goal of providing long-term stewardship of our natural heritage. North American Land Trust accepts gifts of cash, securities, life insurance, or real estate. Contributions may be tax deductible. Thank you, in advance, from all of us at the North American Land Trust.